You're putting on your favorite shirt or sweater and you find a hole. It's not a rip in the seam. It's a hole in a really odd place. How did that happen? You don't remember snagging it or tearing it. And, of course, it's not in a place that you can pass the hole off as a fashion statement. A hole that appears in clothes after washing is one of those mysteries that can only be solved by working through a process of elimination. Consider each probable cause and then do some investigating to check the issue out and see if that could be your problem and then resolve it. Remember, there may be multiple reasons the holes are happening, so keep this list handy. If you are using too much chlorine bleach or not allowing the bleach to thoroughly mix with water before putting in clothes, holes can appear. Abrasive surfaces at work or home can snag fabrics and cause small holes. Then washing the fabric makes the holes more evident. Have you gotten a new table, desk, or countertop? Improperly installed granite or stone countertops have a bad reputation for snagging clothing. Is your clothing catching on belts, zippers, snaps, or grommets while you're wearing the garment? Check suspected culprits for rough edges. You may be able to smooth surfaces with a metal file or sandpaper. Are you using a final spin speed in your washer that is too high for the type of fabric you are washing? Cotton clothes should not be spun higher than 600 revolutions per minute (sheets and towels can use a higher spin at 1400 revolutions per minute). Jeans should spin no higher than 900 revolutions per minute and delicates and silks should use a 400 revolutions per minute spin cycle. If you don't have your washer manual with this information, call the manufacturer or find one online. Spinning too rapidly can pull clothing into the tiny holes and crevices of the washer drum and cause fibers to wear and tear. Are you overloading the washing machine? This not only affects the cleaning level of each cycle but can also cause garments to get hooked on zippers, decorations, and buttons on other clothing. Always zip, button, and fasten all clothing before washing and turn items inside out. Are you missing an underwire from a bra? Underwires can get caught between the drum and the side of the washer and then poke through the washer drum holes. You may not feel it when the washer is empty but the agitation of the washer may cause the wire to snag clothing. To remove the wire, you'll have to remove the outer housing of the washer. If you see dark streaks on the fabric that look like burn marks along with small holes or broken threads, check your clothes dryer drum. Remove the outer housing of the dryer and have a helper shine a flashlight at the back of the dryer drum. If you see any light shining through into the drum, you have a problem. If the dryer drum is not perfectly aligned and balanced, fabric can slip between the drum and the dryer housing. This causes the streaks and can tear holes into clothing. What Can I Do to Prevent Holes in Clothes? 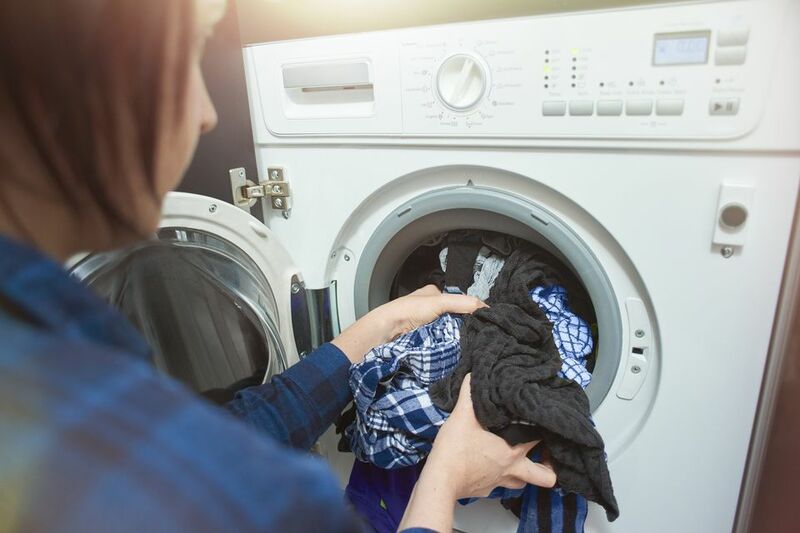 One of the easiest things you can do to prevent holes in clothes during the washing and drying process is to do a better job of sorting clothes before you wash. Never wash a delicate garment with heavy jeans or clothes with zippers and studs. Lace and silky fabrics can snag on zippers and even embellishments like beads and sequins. If you must do a mixed load, protect delicate clothes by putting them in mesh laundry bags before placing into the washer. If you are sure that you've checked everything and all looks well, take a few minutes to survey your closet. Clothes need a bit of space so if you have everything crammed together, snags from other clothes can happen that get worse after laundering. It could also be critters eating holes in your clothes. If you see some insects, check them out and then get rid of them. In addition to moths, insects like silverfish, crickets, roaches, and carpet beetles can all cause holes on different types of fabrics.